This extraordinary work was composed by thirteen Italian maestri. Verdi contributed as last part of the work the "Libera Me". It differs significantly from that of Verdi's "Messa Da Requiem". The libretto of the work was already printed in 1869, but unfortunately the first performance came to nothing because of organizational, financial, ideological and cultural-political differences. Over the years, the existence of the Messa Da Requiem fell into total oblivion. It was David Rosen who discovered eight of the 13 autographs and two copies constituting the Messa Da Requiem in the archives of the Ricordi publishing house in Milan in 1970 ! The exemplary collaboration of the Internationale Bachakademie, the Verdi Institute in Parma, and the publisher G. Ricordi & C. in Milan led to the discovery of other sources of the Messa Per Rossini in Italy. 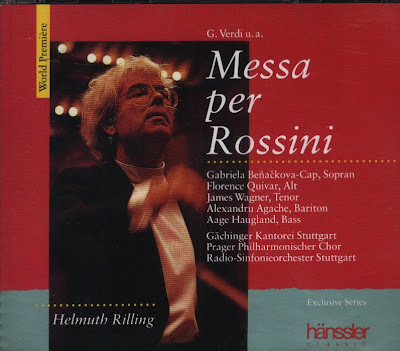 After a 119-year-long archival slumber, the World Premiere of the Messa Per Rossini took place on 11 September 1988. The 2 CD set is a must-have for every collector of classical music ! The Compact Disc (2 CD) was released by hänssler classics, 1989, (DDD). hänssler classic 98.949.